The Olympus XA2 is a viewfinder 35mm camera made by Olympus from 1980 until 1986. The XA2 is, of course, a descendent of the Olympus XA, the diminutive rangefinder designed by Olympus’s Yoshihisa Maitani and introduced in 1979. The XA is not only one of the most ingenious 35mm cameras ever designed, it’s a classic of industrial design; almost every feature you could want in a street-shooting rangefinder camera crammed into a body small enough to fit in your hand. The original XA somehow managed to fit a six-element lens inside this diminutive package; further testament to Maitani’s singular genius. There were some trade-offs to packing so much into such a small camera, however. Though the XA’s lens was ridiculously it was prone to some distortion and vignetting in the corner, a necessary trade-off in making a working lens with such insanely small distances between elements; there was only 31mm from front element to film plane. In order to keep the size of the camera down, Maitani also made a few other important design decisions. The XA did without an integral flash or conventional flash hot shoe. Instead, a separate, especially designed flashgun coupled to the side of the camera, setting the camera’s shutter to its fixed recommended shutter speed (1/60) as it was fitted. Genius, however, rarely comes cheap. The XA crammed many of the features of a pro-spec SLR into this small body, and it also carried with it the SLR’s price tag. New, an XA went for some $233, worth some $808 or £640 in 2018 money. 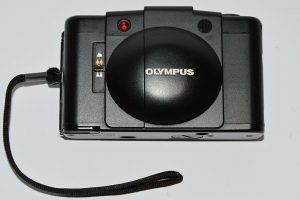 That made it perfect for professional photographers who might want a capable compact to pop in their pocket, bit it certainly out it far above the holidaying amateur crowd who had made Olympus’s Trip 35 such a success a decade before. 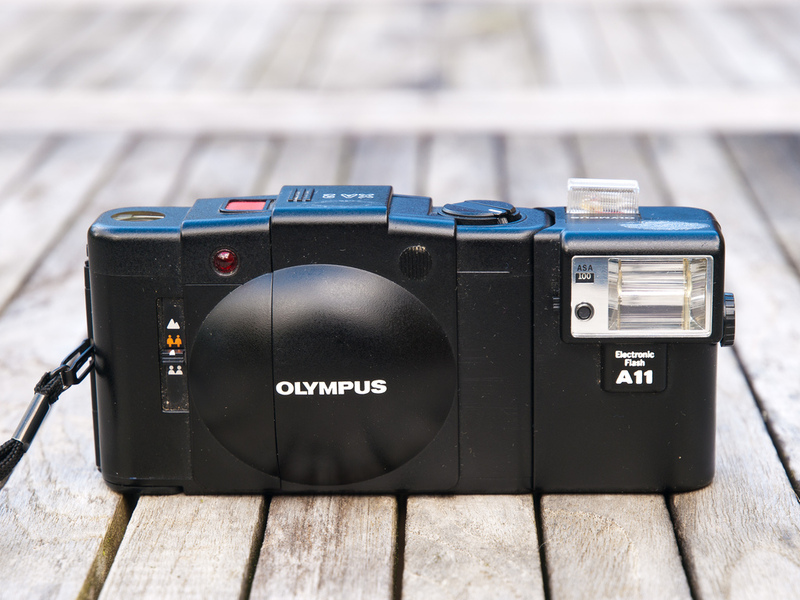 Olympus went back to the drawing board and came up with a simplified version of the XA, released a year later, and definitely aimed at the amateur crowd. Instead of rangefinder focusing, the XA2 used a three-zone scale-focusing system, and a fully automatic metering system. Instead of six elements, the XA2’s 3.5 lens only has four, though this has had little effect on its quality – the lens has characteristic Olympus sharpness. Unlike the XA, the camera’s aperture can’t be chosen on the left-hand side of the camera – instead there’s the focusing scale. The camera chooses both the aperture and the shutter speed itself. You don’t even have to focus – if your subject is somewhere between three feet and infinity, the central distance setting that the camera is set to when the cover is opened will probably get it in focus. Just slide the clamshell cover open and click the shutter. On the XA there was a backlight function on the bottom that immediately added 1.5 stops of compensation in case the subject had prominent lighting behind it (like a person with the sun behind them, for instance). But it does keep the self timer and the very odd battery check – not a light but a high-pitched tone. The XA series might be the only cameras that “sing” to you to tell you they’ve got enough juice to shoot with. This means the photographer has a lot less control, but it does make the XA2 quicker to use – as long as you’re used to scale focusing. 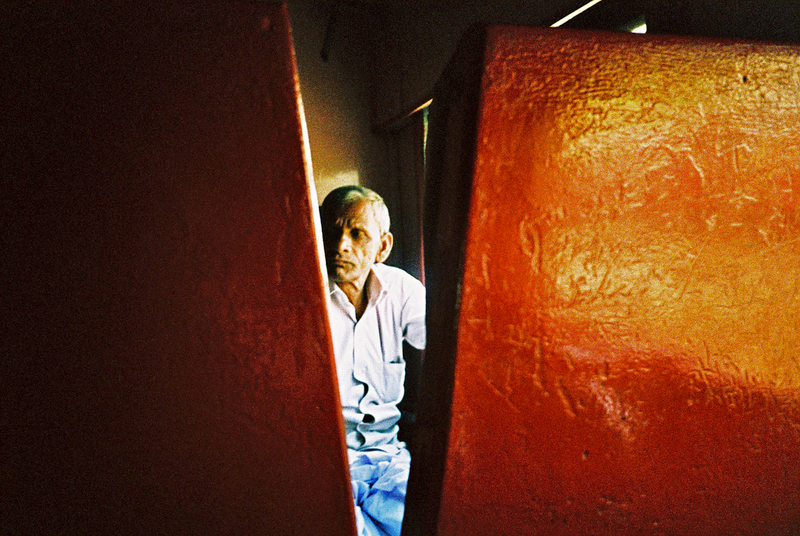 The corner-cutting Olympus carried out on the XA2 made it around 25% cheaper than the XA. 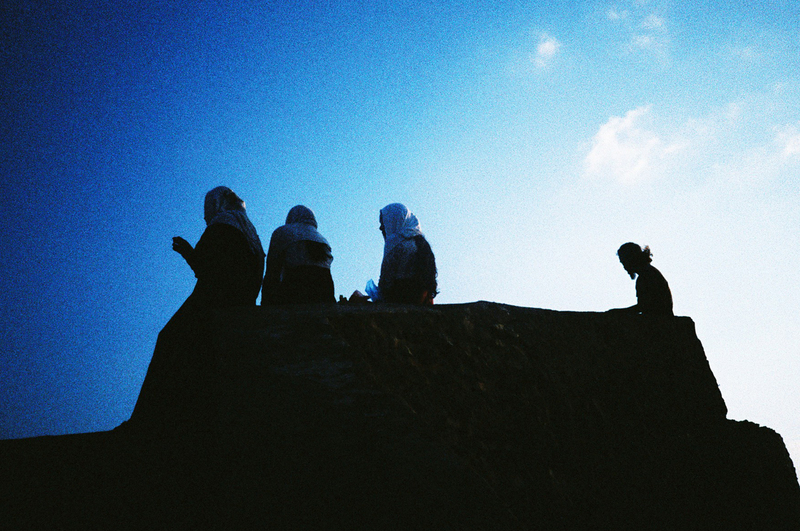 Like the XA, the film is wound on with a thumb wheel, similar to the likes of the Trip 35 or the Lomo LC-A. The shutter button isn’t a traditional raised mutton but – in order to reduce the chance of camera shake, apparently – a pressure sensitive pad. It’s very sensitive. Longtime users recommend keeping the XA series’ clamshell shut if you’re not about to take a shot, as it’s very easy to mistakenly waste a frame. One quirk with the camera is the green light at the side of the viewfinder; this is a signal that the camera doesn’t have enough light to make a correct exposure. Why Olympus chose to make the light green rather than red (the colour used in pretty much every other camera model) is a real mystery. 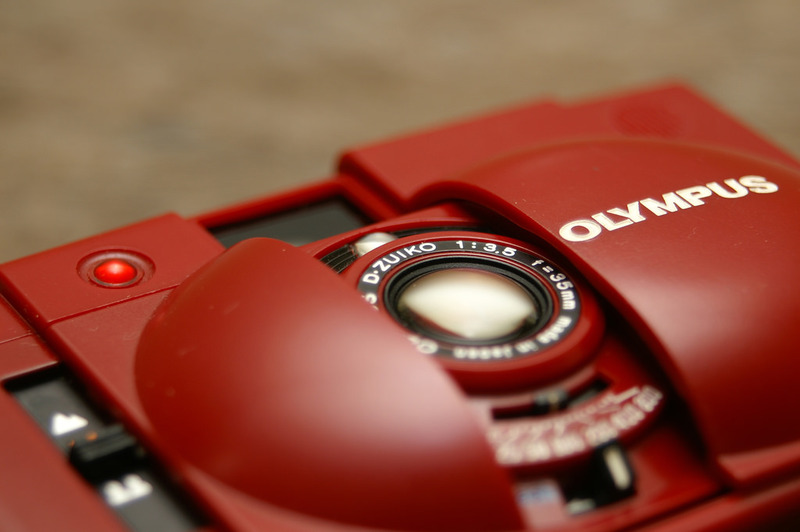 Most XA2 are black, though Olympus did bring out a range of coloured models – white, red and blue, with a few hundred examples in pink aswell. The XA2 was one of five models in the XA family. Oddly, it was released before the XA1, an even more simplified model whose shutter only went as fast as 1/250 and which swapped the battery-operated meter for a selenium one a la the Trip 35. The XA2 turned out to be the most popular model in the XA range, staying in production for six years. Olympus later refined it, adding the backlight function, DX coding and raising the meter sensitivity to 1600 and releasing this camera as the XA3. But the XA2 is a much more common camera – a fact that has helped to keep its price relatively low compared to the original XA. It’s not hard to find an XA2 for around £60 in the UK, with the XA now comfortably over £120 and the much rarer XA4 macro model starting to nose towards £200. The XA2 is much more than a budget XA. It comes into its own as street shooter, especially since its clever clamshell design sets the distance at a very useable distance – just about nine feet – and the camera will automatically keep the aperture as narrow as possible. The XA2’s popularity is growing as the price of its rangefinder-equipped cousins spirals ever higher. More common than the Cosina CX-2 and with little of the hype surrounding the LC-A and its descendents, the XA2 is good choice for those wanting a fuss-free quality compact.